Gesham Magombedze (Ph.D. Applied Mathematics, National University of Science and Technology, Zimbabwe, 2009) develops mathematical models to understand the major factors involved in Mycobacterium avium subspecies paratuberculosis (MAP) infection and host interaction in order to enhance understanding of resistance and susceptibility patterns between pathogens and persistence of infection. 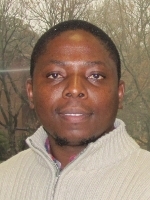 Upon completing his fellowship at NIMBioS, Dr. Magombedze accepted a Research Associate position in the Department of Infectious Disease Epidemiology, School of Public Health, Imperial College, London. Magombedze G, Shiri T, Eda S, Stabel JR. 2017. Inferring biomarkers for Mycobacterium avium subsp. paratuberculosis infection and disease progression in cattle using experimental data. Scientific Reports, 7: 44765. Magombedze G. 7-11 April 2014. Poster: Within cell dynamics: Gene regulatory mechanisms in Mycobacterial tuberculosis latency infection. Within Host Dynamics to the Epidemiology of Infectious Diseases workshop at MBI, OH. Magombedze G. 13 March 2014. Mathematical modeling of immunological and molecular biological process in Mycobacterial infections. City University of New York, New York, NY. Magombedze G. 1 November 2013. Evaluation of the current Johne's disease transmission and persistence paradigm using a mathematical model. Field of Dreams Conference, Phoenix, AZ. Magombedze G. 19 October 2013. Mathematical modelling of the Th1/Th2 immune response in Mycobacterium avium subspecies paratuberculosis infection in ruminants. MDA Annual Conference, San Diego, CA. Magombedze G. 1-6 October 2013. Modeling the immune response of cattle infected with Johne's Disease. SACNAS Conference, San Antonio, TX. Magombedze G. 29 April 2013. Mathematical modeling of host-pathogen immunological interactions and molecular biological systems. Math Colloquium, West Virginia University, Morgan Town, WV. [Online]. Magombedze G. 13-18 March 2013. Poster: Latency and dormancy gene regulatory mechanisms in Mycobacterium tuberculosis latency infection. Keyston Symposium: Host Response in Tuberculosis, Whistler, British Columbia, Canada. Magombedze G. February 2013. How to develop immunological models for infectious diseases. Guest Lecture, Howard University, DC. Magombedze G. February 2013. Transmission and persistence of Johne's Disease. Mathematics Colloquia & Seminar, Howard University, DC. [Online]. Magombedze G. December 2012. Mycobacterium tuberculosis latency regulation: Insights from mathematical and computational modeling. John Hopkins University, Baltimore, MD. Magombedze G. October 2012. Mycobacterium tuberculosis regulatory mechanisms in latency infection. University of Minnesota, Minneapolis, MN. Magombedze G. September 2012. Understanding Mycobacterium tuberculosis latency infection. Emory University, Atlanta, GA.
Magombedze G. September 2012. Understanding the underlying mechanisms of persistence in mycobacterial infections. NIMBioS Seminar Series, Knoxville, TN. Magombedze G. August 2012. Poster: Transmission and persistence of Johne's disease: Is the iceberg phenomenon consistent with disease transmission dynamics. Workshop for Young Researchers in Mathematical Biology, Mathematical Biosciences Institute (MBI), Ohio State University, OH. [Online]. Magombedze G. July 2012. Assessment of Th1/Th2 immune response paradigm in Mycobacterium avium subspecies paratuberculosis infections. Society for Mathematical Biology Annual Meeting, Knoxville, TN. Magombedze G. February 2012. FME (R package) for sensitivity analysis in ODES. Math Biology Seminar, University of Tennessee, Knoxville, TN.